When the body of man is found in a canal, damaged by the tides, carrying no wallet, and wearing only one shoe, Brunetti has little to work with. No local has filed a missing-person report, and no hotel guests have disappeared. Where was the crime scene? And how can Brunetti identify the man when he can't show pictures of his face? The autopsy shows a way forward: it turns out the man was suffering from a rare, disfiguring disease. With Inspector Vianello, Brunetti canvasses shoe stores, and winds up on the mainland in Mestre, outside of his usual sphere. From a shopkeeper, they learn that the man had a kindly way with animals. At the same time, animal rights and meat consumption are quickly becoming preoccupying issues at the Venice Questura, and in Brunetti's home, where conversation at family meals offer a window into the joys and conflicts of Italian life. Perhaps with the help of Signorina Elettra, Brunetti and Vianello can identify the man and understand why someone wanted him dead. 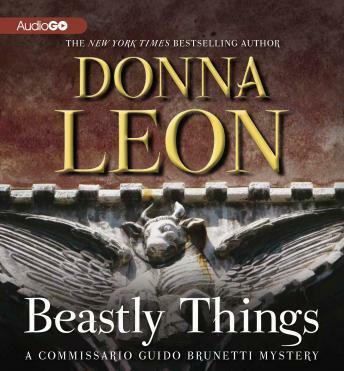 As subtle and engrossing as ever, Leon's Beastly Things is immensely enjoyable, intriguing, and ultimately moving.